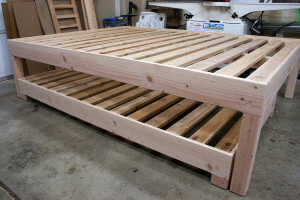 Having been asked many times in the past, I finally designed and built a trundle bed frame. It has a queen mattress on top with a twin underneath. A nice feature is that I hid the wheels on the twin frame up inside its legs, so it “floats” over the hardwood floor. The upper frame is a little longer than a regular queen frame and the lower frame is a little shorter than a regular twin frame, but it worked out great and the customer is quite happy with it.